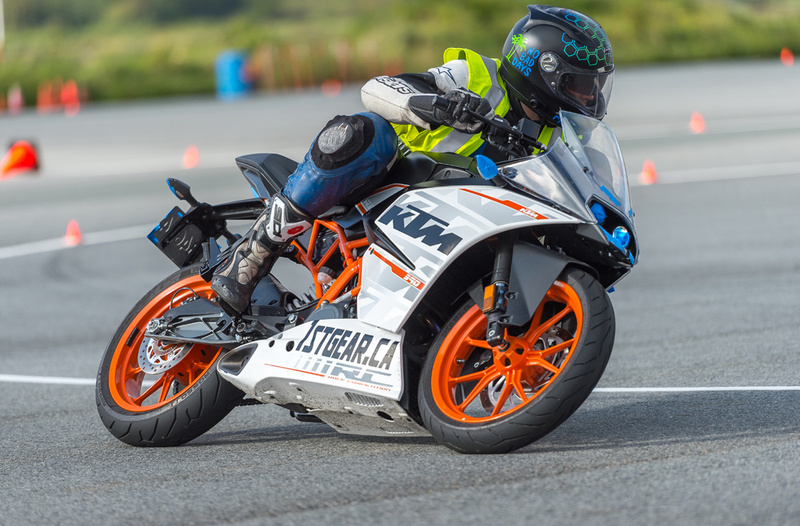 KTM RC 390 – The first 500kms. Initial experience. Two weeks ago I managed to get my hands on a KTM RC 390. It came in to replace the Yamaha R3. I was really excited about this motorcycle as I love small cc sport bikes. It is a sector that all the big brands are growing into. They are well under $10,000 and some below $5,000. The KTM RC390 comes in at one of the most expensive at $7,000+ Out the door at your local dealer (taxes, fees, etc). If you can find one used like I did (good luck!) you’ll save yourself $1,000. My first ride was from Victoria to Vancouver. My excitement for the bike was worth it. The track inspired 375ccs delivers. Not much in the lower RPMs but up high its party time. This is the small cc bike that is a serious threat to your license. This is usually reserved for the 600cc sport class. Early into the ride the small, firm seat has limited range. You won’t be comfortable on it. It has the most aggressive seating position among its peers. This is a track bike with signals. While commuting around town and through traffic the RC390 is disgusted with it. The low speeds are not smooth (might be due to the emissions controls) and it begs you to be ridden faster. While it is certainly capable, you will start wishing for a softer seat. Next up a track day, this is what I was really looking forward to. Once I found my groove with the RC390, it was happy and I was getting there. I definitely feel the extra power over it’s competition but it is not substantial. The Pirelli Rossos are stock tires so feeling planted isn’t a issue, the suspension is adequate. Through the corners I had no problem maintaining a solid line. Brakes are strong! There is more stopping power here than you can hold onto. If you grab too much the ABS will save the day (or try too). These first 500kms have been fun but they have not been living up to my expectations. For a track bike I wish there was some front suspension adjustment. I also wonder why disabling the lights (or removing them) is not easier. Only the mirrors come off easily and maintain its aggressive looks. The fender would be a day project to remove. So far the value that Yamaha, Kawasaki, and Honda have for their 300cc offerings is easier on the wallet and the performance is not too far off. Let’s see how the next 500kms goes. I look forward to higher speed cornering on a the local Sea 2 Sky highway and Mission Raceway. That may have to wait until 2017.